Wiel (pronounced, "wheel") is a famous athletic name in Curacao, but not because of the island's present passion and claim to fame. Baseball was a secondary sport when Randy Wiel was competing internationally for his homeland in basketball, as an Olympic sprinter and in swimming. 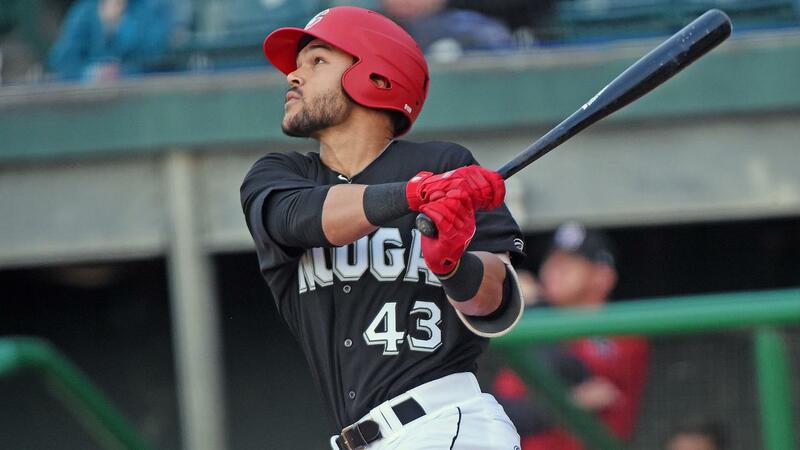 "He played baseball growing up, but not that much," Chattanooga Lookouts outfielder-first baseman Zander Wiel said of his father, who played basketball at the University of North Carolina and became an NCAA Division I coach. Born in Tennessee, the son hasn't been to Curacao in years after visiting often when he was younger, but he hopes to add to the island's baseball pedigree, if a generation removed. Since Andruw Jones in the mid-1990s, Curacao has sent a host of players to the Major Leagues, with Kenley Jansen, Didi Gregorius, Andrelton Simmons and Ozzie Albies among the bigger names. "I doubt if they know who I am yet, but I certainly follow them," Wiel said. "I feel a connection and want to join them." The 25-year-old right-handed hitter was raised in Murfreesboro, where his father was coach at Middle Tennessee State. He played on a College World Series championship team at Vanderbilt before being selected by the Minnesota Twins in the 12th round of the 2015 Draft. It took a while for Wiel to establish himself as a prospect, but he's done just that this season. Wiel has a .306/.367/.437 slash line through 55 games with the Lookouts in his first year of Double-A and was selected as a North Division starter for the Southern League All-Star Game at Birmingham on June 19. "Zander plays the game right and he plays the game hard," Chattanooga manager Tommy Watkins said. "He does everything it takes to be ready each day and it shows with his batting average. He's had a very good start." Wiel has also increased his versatility in the field. After entering the season a first baseman, he's split time in the outfield and was scheduled to start in right field at the All-Star Game, as well as bat sixth for the North, before landing on the seven-day disabled list retroactive to June 10 because of a sacroiliac joint dysfunction. "The more positions you can play, the better chance you give yourself," Watkins said. "It means more opportunities." The only negative for Wiel this season is a decrease in homers. Before hitting the DL, he had 18 doubles and 32 RBIs but had gone deep just three times. "His power numbers aren't there yet, but I think you'll see them come," Watkins said. "I think that is just a matter of time." Wiel isn't concerned. He just wants to keep doing what he's been doing and let the results come. "I worked a lot this past offseason on trying to be a better all-around hitter instead of just a production guy," he said. "It hasn't been as much about a change in my swing or anything as much as it's been about a change in the mindset and approach. Even though a swing is a violent thing, I'm trying to make it as easy and as calm as I possibly can." Randy Wiel was an athletic renaissance man. Not only did he excel at multiple sports before turning to coaching, but he became an ultra-competitive equestrian after leaving the bench. His son has always had a narrower focus, although the hobby of beatboxing makes for an interesting sidelight. After giving up basketball early in high school, baseball was his only athletic pursuit. "It was always my sport," he said. "I knew it by nine or 10. I only grew to 6-foot-3, so it would have been the right choice anyway. But I always loved baseball." It's Curacao's passion and the passion of this native son once removed. Homer binge snapped: Jacksonville outfielder-first baseman Peter O'Brien finally went without a homer on June 12 against Biloxi, settling for an RBI double after tying the Southern League record by going deep in six consecutive games. O'Brien, 27, hit seven homers during the streak and drove in 13 runs. The former Major Leaguer hit seven homers in 31 games for Tulsa in the Double-A Texas League and matched that total in his first 10 games for the Jumbo Shrimp. A single during his two-homer game on June 11 was his lone hit not for a homer during the streak, which tied the SL record set by Derrek Lee with Memphis in 1996. On record pace: Biloxi closer Nate Griep had his streak of 16 consecutive saves snapped June 11, but the right-hander was still on pace to set a Southern League saves record. The eighth-round pick by Milwaukee in the 2015 Draft out of Kansas State led the Minors with 21 saves in 23 opportunities and the league record is 37 saves set by Matt Peterson of Jacksonville in 2009. Griep, 24, saved 30 games last season in the Class A Advanced Carolina League after recording 23 saves in the Class A Midwest League the previous season. His only decision this year was a loss in his streak-snapping blown save at Jacksonville, when Monte Harrison hit a three-run walk-off homer in the ninth inning. One better than none: Infielders Kevin Medrano and Juniel Querecuto where ready to come off the Jackson disabled list at the same time, but only one of the Southern League's two top hitters for average ended up in the Generals' lineup. Medrano was activated on June 8 and had nine hits in his first 19 at-bats, raising his average to .369. Querecuto, though, was promoted to Triple-A Reno the same day by Arizona and left the Southern League with a .369 average. Querecuto, primarily a third baseman, had been sidelined since May 29. Medrano, who primarily plays second base, had been out since May 23. Moving on up: Right-hander Pablo Lopez had just a 1-2 record in eight starts for Jacksonville, but his 0.66 ERA meant a promotion to Triple-A New Orleans on June 6 for the Miami Marlins' No. 21 prospect. Lopez, 22, allowed 30 hits and just three earned runs over 43 2/3 innings for the Jumbo Shrimp while striking out 51 and walking eight. Opponents hit .184 off the native of Venezuela and he had a 0.87 WHIP before moving up to the Pacific Coast League, where he won his first start. Lopez, who began this season on the disabled list, was acquired by Miami as part of a trade with Seattle last July.